Looking at Restoration Hardware's catalog last week I realized I am not a great fan of some of the recent furniture trends. I like real wood for its character and how a good finish will bring it to life with its patina adding depth to the piece. Real woods, Mahogany, Maple, and Cherry, etc., may not look exciting in their raw, freshly cut state, but they look beautiful when finished. For several years natural-edge slabs have been used as the tops of furniture, cracks dovetailed and a finish highlighting the beauty of the wood. Then there was the movement to using reclaimed timbers - which is good, if it is reworked as clean finshed timber, but if the timbers have a "straight from the side of a barn" look they may work around a barbeque pit but, to me, they do not fit in a house. 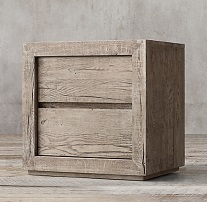 Restoration Hardware's collections of reclaimed timber styles is huge but why anyone would want a new bedside cabinet with visible cracks in the draw fronts? The Printmaker's is designed to look like old type drawers – you have probably seen them - only a few inches deep with lots of partitions to store wood or metal type. My father was a printer. When I was young he made a box for my Meccano set(English version of Erector set) from an old type tray cut in half so the halves stack on top of each other with an added lid. Some of the drawer partitions were removed to accommodate the different sizes of my Meccano pieces. 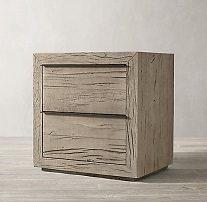 Obviously a drawer made to look like a print tray would not be very practical for storing books/clothes in a bedroom, so Restoration Hardware have made the draws normal height but added two sets of pulls to each front to look more like two print drawers. I accepted the modification of an old print drawer for my Meccano but I find it odd faking the front of a new bedroom dresser to make each drawer look like two thin drawers. 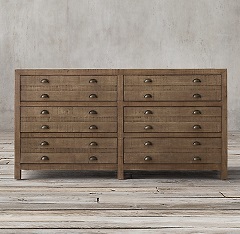 Some of the modern furniture is made from rough cut, distressed solid pine and finished to look old. A few years ago one of our members showed me a beautiful coffee table he had designed and made for an interior decorator – the client wanted the finished table to be "distressed" which I think means hitting it with hammers and chains. The member made the table but he left the distressing to the designer – making a nice piece of furniture then beating before you ship it up does not always fit well with the woodworker. 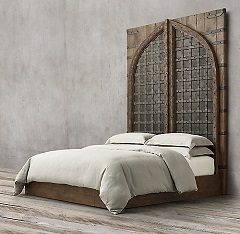 Now Restoration Hardware has an Indian Fortress Bed. but not sure I would be allowed to put it in the house. Frank called the meeting to order at 6:20 PM. There were 24 people in attendance. Frank Barnes was a guest. 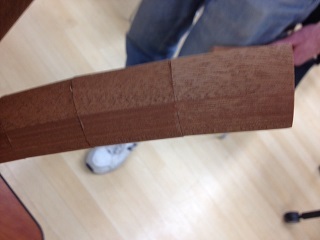 Bruce Powell announced that the remaining mahogany molding was available for $1.00 per length. 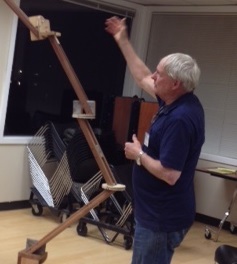 He also called attention to the remaining tools donated by a former member that were available for silent auction. Stan Booker is still looking for veneer donations for Montera Jr. High in Oakland. Shawn Williams mentioned that he is available to create a video of anyone's project and help post it on YouTube or other social media. Shawn can be contacted at Shawnbuilds74@gmail.com or by calling 415 418-4657. 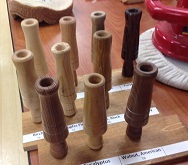 He brought in 11 duck call turnings made from various different woods. All but one were polished. Ken also brought in four powered buffing tools, three stationary and one hand held automobile buffing machine that he uses on large surfaces. He sands only up to 240 grit sandpaper before buffing. The entire buffing process takes him about 20 minutes to complete - much faster than traditional wet finishes. 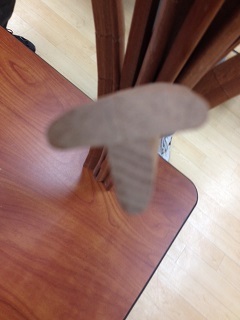 He typically buffs smaller wood pieces that can be hand held. 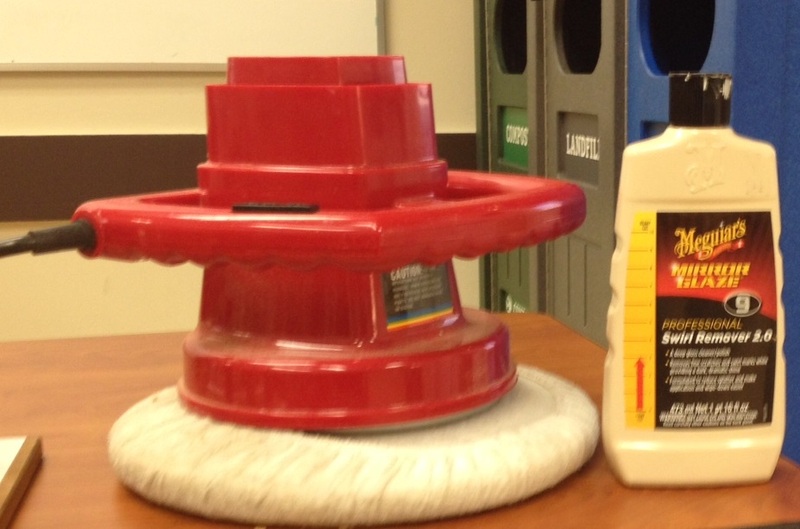 Buffing involves three compounds - tripoli, white diamond and carnuba wax. A different buffing wheel is used for each step. He noted that pieces can be buffed either before or after applying finish, although he finds that he gets a slightly glossier effect by buffing last. 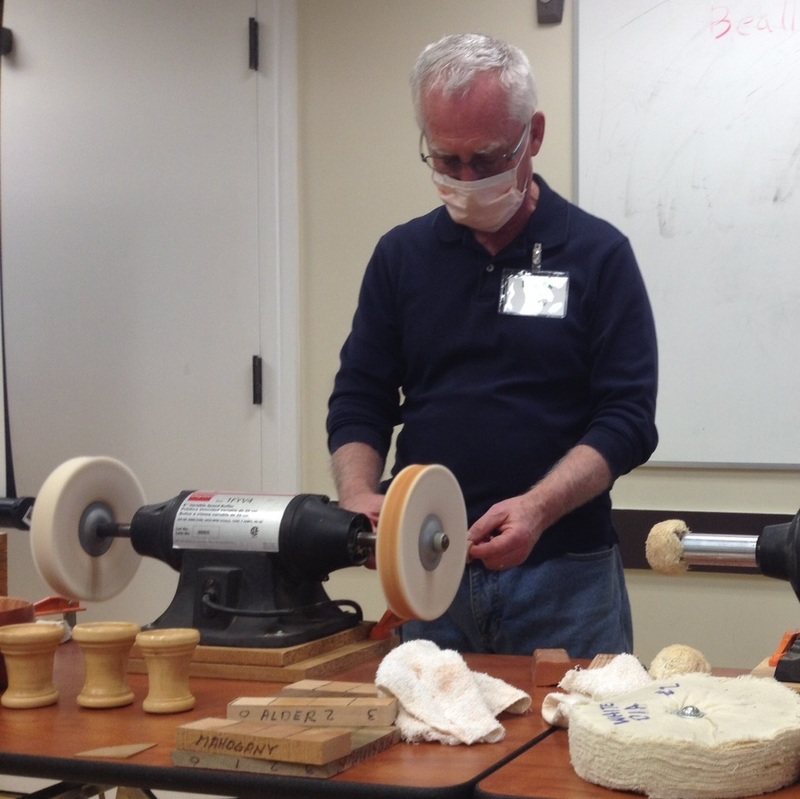 After a short break, Ken talked about hearing protection and the noise levels for all the power tools in his shop. He found typical sound level values in Fine Woodworking magazine. He mentioned that iPhone users can get an app that turns their phone into a sound level meter. Look for Decibel Measurement, Decibel X Pro, and others in the App Store. Ken keeps two external earmuff style hearing protectors in his shop, one for himself and one for his wife who occasionally helps him in the shop. When purchasing hearing protection, look for sound attenuation values of 25dB or more. Ken also talked about dust collection and the process of figuring out what size dust collector and what size ducts you need for your shop. Different power tools require different CFM levels. He bought an anemometer for measuring airspeed at each duct to make sure he had sufficient airflow per the recommended CFM for each tool. 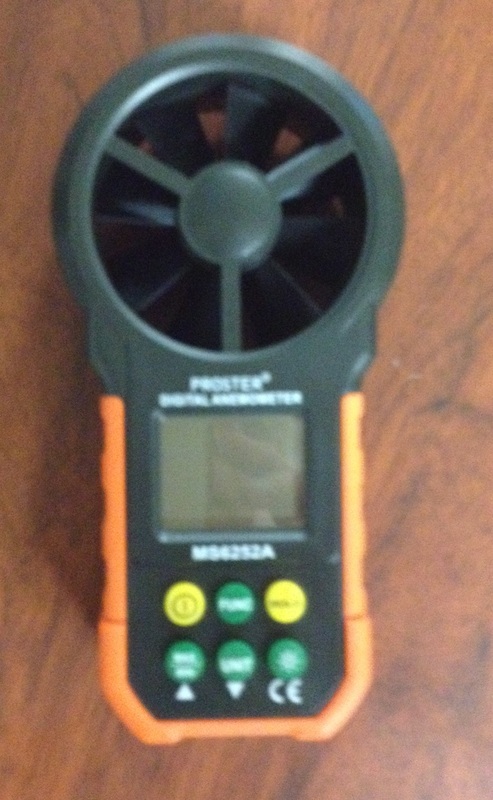 He is willing to lend the anemometer to anyone who would like to borrow it. Jon Kaplan and Bruce Powell presented items for the challenge. Jon brought in a flower shaped piece he made using short sections of molding that he glued and shaped and then hot melt glued together. The short sections making up the stem. Bruce made a controversial piece that stood about eight feet tall. 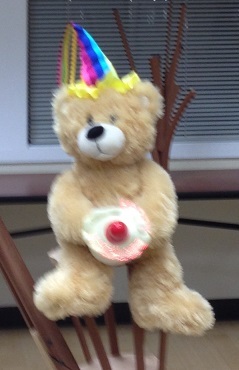 that it was an articulated stand for displaying a stuffed animal. 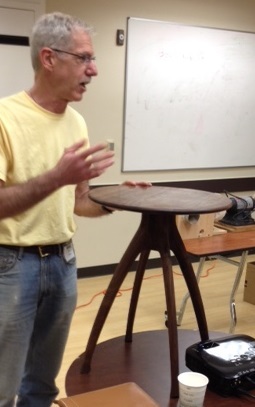 Jon Kaplan brought in a beautiful walnut side table he made at a weekend workshop at the Maloof Foundation in Southern California. 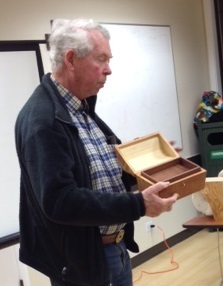 Harry Filer showed us a small toolbox he had made and a treasure chest from Frank Taylor that were being considered as possible future projects for the toy workshop. Western Plastics will be hosting the March meeting. They'll demonstrate fabrication techniques using their laminate and solid surface countertop materials. Refreshments will be served. The door prizes at the February meeting were a big hit and so will be repeated in March. Only paid up members will be eligible. After four months, Norma Brooks is still looking for help with the newsletter. She needs a staff of three "BAWAnians" to coordinate the mailing list, coordinate advertising, and get the newsletter printed and distributed. Work on the Larkin Street Youth Center is almost complete. 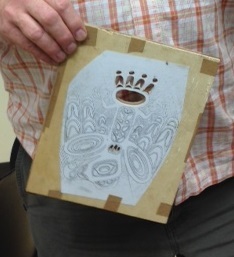 The group was able to do an estimated $100,000 worth of work for a mere $15,000! The last phase of the remodel, a new staircase, classroom and counselors' offices starts now. Project coordinator Peter de Goey includes a detailed list of activities to be completed over the next five weekends. During the February meeting, Don Segale gave a demonstration of his new Cabinetware computer design system (Remember - this was 1989). It can draw out a floor plan, lets you insert a vast inventory of different cabinet shapes and sizes, and prints out a 3D view of the design at any desired angle. When the design is complete, "with the push of a button a full cut list is spit out." This really was the dawn of the age of CAD for the trades. 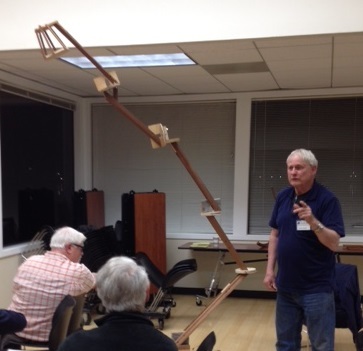 The newsletter included the third in a series of articles by Peter Good about his experiences on the woodworking show circuit. 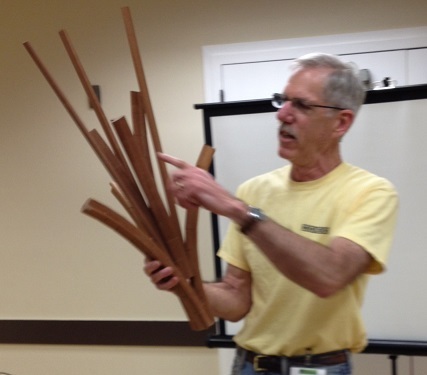 This month he relates his observations about the state of woodworking (professional and hobbyist) in various cities around the country based on show attendance, purchases, and interest in seminars. Apparently woodworking is suffering in Portland, Kansas City, Boston, Denver, New Jersey, and Rochester, NY. It's thriving in Seattle, Pennsylvania, Dallas, Chicago, Detroit, Milwaukee, and Tampa. And he makes the interesting observation that nobody buys books in Kansas City. In the Letter from the President, Keven Seger once again put out the call for more members to participate in the various committees and to run/sponsor activities. He sounded pretty desperate. I guess some things never change.